WHEN Swiss engineer Eduard Locher revealed he'd got the government's okay to build a railway from the shores of Lake Lucerne to the summit of the 2200-metre high Mount Pilatus in the craggy Swiss Alps, folks decided that either the government was mad, Mr Locher was mad, or both were mad. 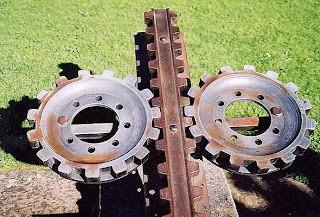 Even so Mr Locher's railway wasn't going to climb Mount Pilatus at a miserable 37-degrees – his was going to do so at an astonishing 48-degrees, and to achieve this he had to re-think the cogwheel concept. He reasoned that rather than driving-cogs that engaged "a rack" of vertical teeth cut into rails – and possibly pop out at the almost-perilous 48-degrees with calamitous runaway results – his wheel-and-cog arrangement would have horizontal teeth on both sides of a centre rail, making it impossible for the driving-cogs to disengage while either climbing up, or braking down, the mountain. When the government declined to subsidise his railway, Mr Locher raised the money from investors – once more to most peoples' dismay – and 119 years after opening in June 1889, the Mount Pilatus Cogwheel Railway is still privately operated and has never suffered a loss. The first Mount Pilatus trains were steam powered, but this was changed to electric power in 1937, and today each of the little red train cars that from a distance resemble some child's toy train-set amid the tangled peaks of the Swiss Alps, take 30-minutes to ascend from Alpnachstad on Lake Lucerne, to Pilatus' summit. The view from here is breathtaking, and if ever you've wanted to do a Julie Andrews and start hollering The Hills Are Alive, this is the place to do it. Visitors gaze down from this eagles' eyrie to Lake Lucerne and its fringing postcard-pretty villages, fields of wild flowers and babbling mountain streams, the city of Lucerne itself, myriad crystal blue lakes… and in one direction, no less than seventy-three mountain peaks in a row. A couple of hotels, seven restaurants and a rope suspension-bridge playground huddle up here on the granite peak, and millions of tourists a year flock to hike, rock-climb, cycle narrow trails, and ride a 6km sledge run. Or just sit in the sun on deck chairs and admire the distant snow-capped peaks, or take a meal at the outdoor tables with their kaleidoscopic views. 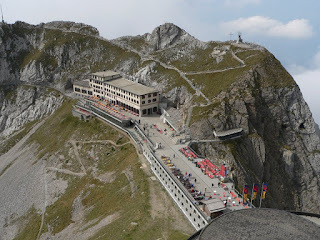 And while the majority of visitors are day-trippers, some overnight in this lofty outpost, choosing either the cosy 3-star Hotel Bellevue with its 28 rooms and newly-renovated bathrooms, or the historic circa-1890 Hotel Pilatus-Kulm (Pilatus Summit) that has 23 more-rustic rooms. Mountain-top dining includes Switzerland's famed cheese fondue, grilled breast of chicken wrapped in bacon with a mustard crust, noodles with julienne vegetables, tender Dentenberg roast pork stuffed with prunes, and herb tofu piccata on a tomato sauce with rice and vegetables. And always, simply always, crème caramel with whipped cream to finish, while if you've a taste for a glass of white or red to celebrate conquering the mountain aboard the world's steepest railway, there's the local Lucerne Schloss (Castle) Heidegg Riesling-Traminer, a Blauburgunder red, or the Weingut Heidegg Pinot Noir. Many visitors opt to take the cogwheel railway the 4618-metre ride to the summit and return to Lucerne by cable-car, that in turn offers the opportunity to get off half-way down and toboggan the remaining 1350-metres along zippy steel shutes. DOING IT: The cogwheel railway operates May to November, but the cable car operates year-round; snowshoe trekking is popular in winter, as is sitting around a hot fondue surrounded by a sea of fog and cloud. There's a Christmas Market over two days in mid-November. Rail Plus includes the Mount Pilatus Cogwheel in a 5-day Tops of Switzerland package to Interlaken and Lucerne from $680pp including breakfasts; details 1300 555 003, (03) 9642 8644 or www.railplus.com.au . Ask also about the Swiss Consecutive Rail Pass and Swiss Card. 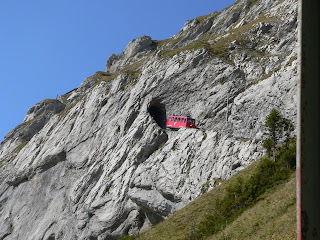 TOY-like: a little red cogwheel rail car inches into a tunnel on Switzerland's Mount Pilatus, the world's steepest rail line. HANGING on – no room for a fear of heights at this eagles' eyrie on the mountain's summit. RACKING up a reputation: the horizontal rack-and-cog system that gets the trains up and down the mountain.